I’d also heard a lot of talk lately about The Rapture and End Times. 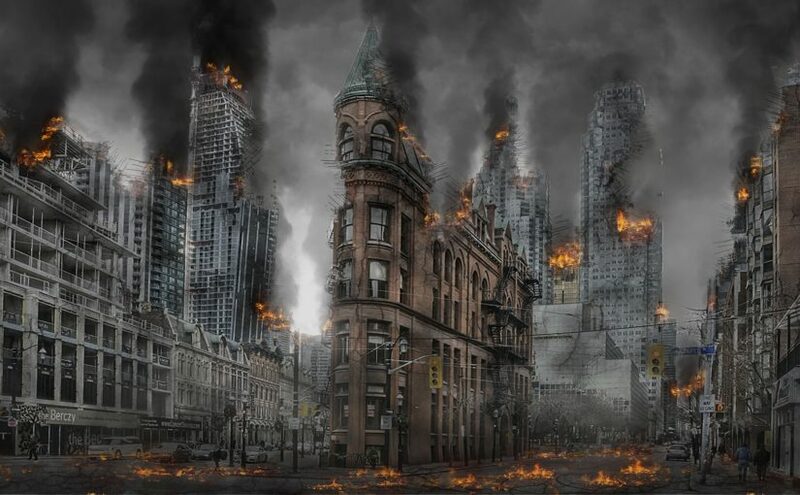 We were living in “the last days,” they said, and it was just a matter of time before the events in the book of Revelation, the last book of the Bible, would begin to unfold: one by one and in sequence. Once it started you could even write the prophecies down in a list form and check them off as they happened. Some of the prophecies had already “been fulfilled,” apparently. There was a verse about a fig tree blossoming and withering and that verse meant that Israel would someday become a nation. Well guess what, that had already come true in 1948. (I had the date memorized simply from hearing it spoken about so many times.) Other major events were still to come, like the Rise of the Antichrist and the Beast. It wasn’t the first time I’d heard about him (I took it for granted that the Antichrist was male) and thus pictured him as I always did: A tall sinister figure wearing a black cape or robe, facial features blurry (though his eyes were glaring) and distinctly human. Basically a mash-up of all the Disney villains I’d absorbed over the years. And because they always referred to him as “the rise of,” I tended to picture him a little hunched down and then rising up to full height. I knew it meant something about gaining power over the world but I didn’t know much about government systems yet and still tended to imagine ruling powers as being kings and queens and knights. As for the Beast, well he was to rise out of “the sea” specifically, so naturally that’s exactly what I pictured. A monstrous gorilla-like thing slowly coming up out of the ocean as if standing on a platform, beads of water rolling down his coarse fur, head tilted back and ready to roar. I knew this wasn’t correct though as the Beast was supposed to have several heads (a lion, an eagle, a man), hair like a woman, the tail of a scorpion, and the arms and claws of a bear. Or was it the Antichrist who looked like that? But that night as Mom and Dad and my grandparents discussed Y2K, sitting on the living room couches sipping tea and finishing off servings of apple pie, I was more or less minding my own business while they talked. Reading an Archie comic mainly, but finding I was just staring at his freckled cartoon face while listening intently with a cocked ear. They spoke in excited yet solemn tones, leaning toward each other; each taking turns to add their own thoughts as to how it might all come to pass. The Christmas tree twinkled in a corner. It was Boxing Day and I was still enjoying the warm glow of the festivities of the day prior, the lingering scent of turkey, and my prized new toys and gifts stacked beside me on the armchair. I hugged my stuffed green turtle a little tighter in my lap. If Y2K really was going to be a terrible disaster, would it all happen around me in the sense that I’d watch the burning piles of rubble from my windows and hear the people outside running around screaming and wailing—or would I be hurt too? Would we all die? Was it going to be the end of the world? Oh—but no because the Rapture. Yes, they were talking about that now, how Y2K might lead to the Rapture. I took some comfort in this: we were going to be safe because we were Christians. We were in; not out. The Christians were going to float up into the clouds and go into heaven behind the clouds, and we would be kept safe. We didn’t have to fear the Beast or the Antichrist because if we saw them rise to power before the Rapture, we were at least going to be magically whisked away at the halfway point, before too much damage was done. Then all of the really big suffering was going to happen to all the unbelievers left behind. I thought about my cousin, Kasey. Her family were unbelievers, and didn’t go to church. My uncle was an “apostate,” Dad had said a few times, though I wasn’t sure what that meant. But at least Kasey would be safe in the Rapture, since she was a kid like me. Kids had an automatic ticket to heaven so long as they hadn’t yet reached the “age of accountability.” But what about my aunt and uncle, would they be left behind since they didn’t believe in Jesus? The suspense increased over the days as New Year’s Eve drew closer. I felt like I was holding my breath. I didn’t stay up till midnight though, I was too young for that. So, I went to bed feeling nervous but holding tight my turtle whom I’d named Yertie after Dr. Seuss’ Yertel the Turtle. He was brand new, fur soft and silky. I nuzzled him with my nose and drifted off to sleep. The next morning I awoke to sunshine and a Chickadee hopping on a thin branch outside my window; a distant crow cawing too. At first I felt relieved but then I panicked. What if the Rapture had happened in the night and my whole family was gone and I’d been left behind all alone ‘cause Jesus had somehow forgotten me? I jumped out of bed and raced out into the hallway calling out for my mom and brother, heart pounding in my chest. I skidded to a stop and let out a rush of breath, blinking as though stunned. Then I grinned and relaxed. I was safe, we were safe, the world hadn’t ended after all. The rest of the day went by without event and I soon forgot all about Y2K. But the yet to come End Times and the Disney Antichrist still loomed over my life like a storm cloud, casting an ever increasing shadow.